Make-A-Wish fundraiser tournament winners (L to R): Bruce Nightingale, fourth; Nick Lane, second; Kevin Manne, first; Dave Romanowski, third. Fifty one pinball players battled it out in the name of a great cause and raised $988 for Make-A-Wish Western New York on Feb. 6 at Pocketeer Billiards and Sports Bar in Buffalo, NY. Through eight hours of qualifying followed by playoffs, Kevin Manne took first place; Nick Lane, second; Dave Romanowski, third; and Bruce Nightingale, fourth. Finishing eighth overall was Joe Ciaravino of Toronto, Ontario, Canada, who took home the trophy for B Division. The full final standings are below and will be posted to the IFPA soon. 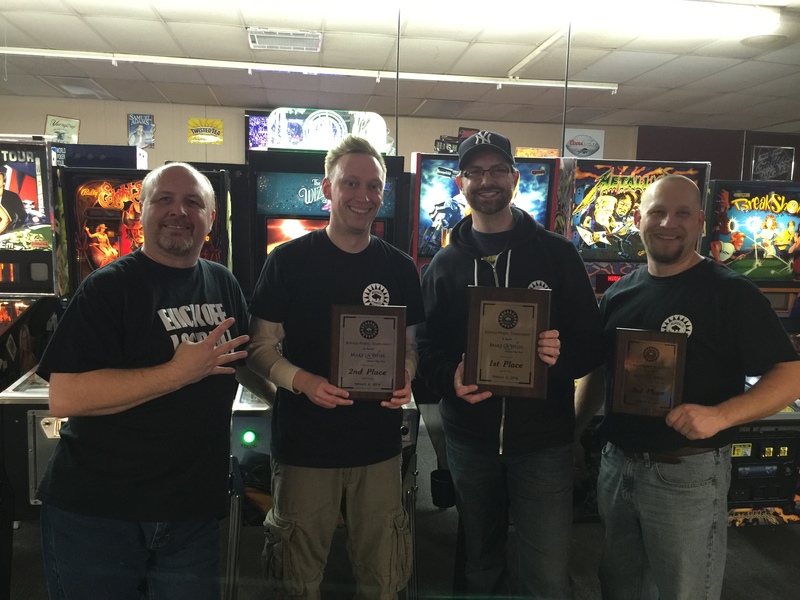 Thank you again to Tony Martin Awards for their generous donation of plaques for the winners, and to all who came out to play some games and support Make-A-Wish WNY! This entry was posted in Tournaments and tagged buffalo, fundraiser, make-a-wish, pinball on February 7, 2016 by k3v2.